At Style and Story, we are lucky enough to have photographed several weddings at the Ohio Statehouse. From working there, we know that the interior is gorgeous. The beautiful staircases provide great backgrounds for pictures. 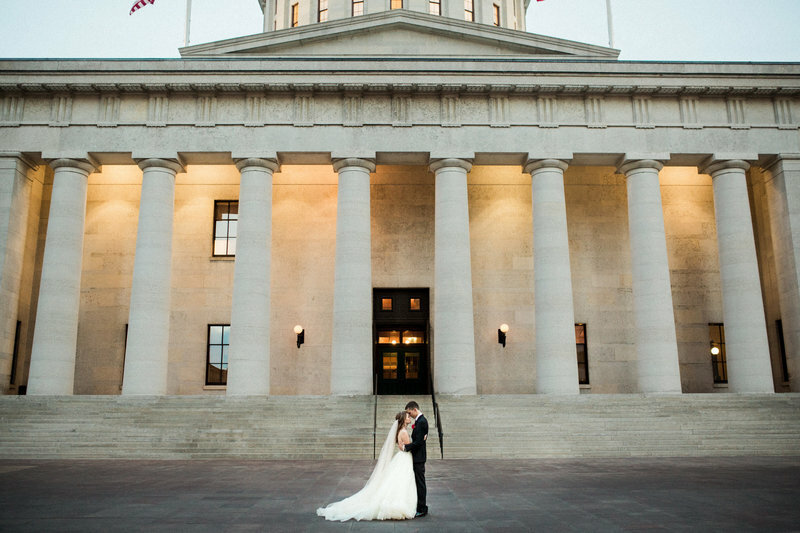 The exterior is stunning too, and you are sure to want at least a few pictures of you and your wedding party posing in front of the majestic columns at the Ohio Statehouse. 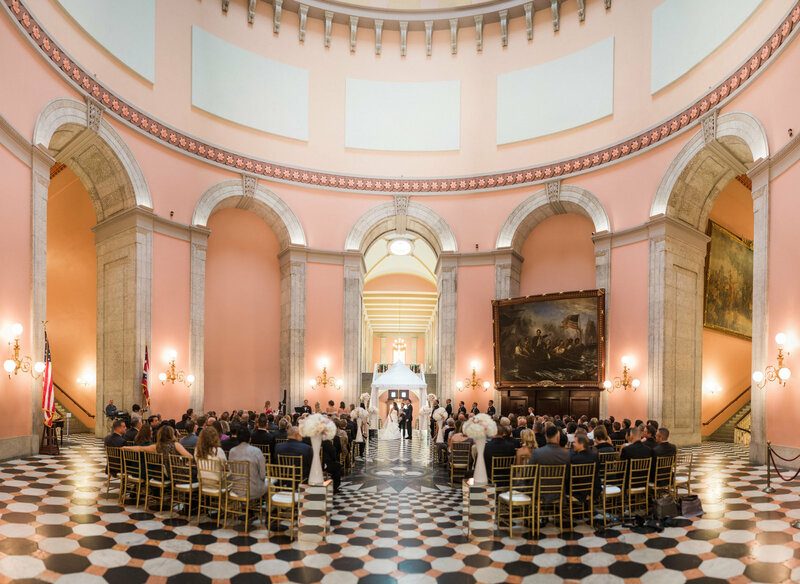 If you are unsure if an Ohio Statehouse wedding is right for you, take a look at some of the photos we have taken for weddings there. This beautiful, historic venue has received The Knot's "Best of Weddings" award in both 2017 and 2018, receiving high ratings on both The Knot and WeddingWire. Plus, Sophie Chase, the venue's wedding coordinator, has received high praise from couples on both sites. The Wolfe Terrace, which is included when you rent the John F. Wolfe Palm House, is a brick veranda which offers a dramatic photo opportunity, especially at dusk. Here, you can also take stunning photos of the botanical gardens. The Capitol Square Review and Advisory Board (CSRAB), who take care of scheduling, can provide you with a list of preferred caterers. Because of the restrictions involved with using an outside caterer, it is probably best to stick to their preferred catering list. With seven preferred caterers, you have several great options to choose from. If you want alcohol at your celebration, Milo's Catering and Banquet Services is the only company permitted to provide alcohol for weddings at the Ohio Statehouse. This is a historic building, so there are certain regulations on what sort of decorations and other items are permitted.The venue staff will provide much of the equipment you need for your event, and if your needs exceed the venue's inventory, they have a list of equipment providers who can help with lighting, sound, or other needs. Some couples who prefer an outdoor ceremony choose the ScottsMiracle-Gro Community Garden Campus, which is a garden situated on four acres of edible plants. This spot can also be used as an area for your cocktail hour. The Ohio Statehouse has three wedding package options: ceremony-only, reception-only, or both. All packages include Ohio Highway Patrol security, which is a great way to ensure that you don't have uninvited guests crashing your party. Your package also includes the labor for set-up and take-down and your own wedding coordinator. Sheltered parking as well as white padded chairs are also included in all wedding packages. Basic AV equipment is also included in the cost. No matter what option you pick, the venue has a maximum guest capacity of 275 people. The ceremony-only package costs $3,500. Weddings take place in the Rotunda, and the package includes a one-hour rehearsal the day before the wedding. The reception-only package is $4,500,and receptions take place in the Atrium. With the combined package, which is $8,000, guests have access to the Rotunda, the Atrium, and the south porch, just off of the Atrium. For over 100 years, couples were not able to host their wedding or reception at the Ohio Statehouse. It was not until May 2007 that couples were finally given this option. With the exception of national holidays when the building is closed, the venue is available on a first-come, first serve basis for couples wanting to get married. The facilities are open from 7 am-12 am daily, but your guests cannot arrive before 8 am, and everyone must be gone by 11 pm. Clean-up begins at 11, and there are no exceptions. 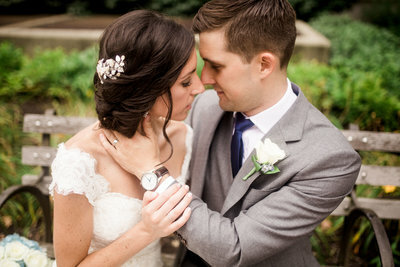 Click to see Rachel & Ryan's incredible wedding at The Ohio Statehouse. Click to see Patty & Jamie's incredible wedding at The Ohio Statehouse. Click to see Erin & Riley's incredible wedding at The Arcade Cleveland.